Not to be confused with World 2-5, Level 2-5, or Stage 2-5. Area 2-5 is the fifth course of Jumpy Jungle and the fourteenth course overall in Mario vs. Donkey Kong: Mini-Land Mayhem!. 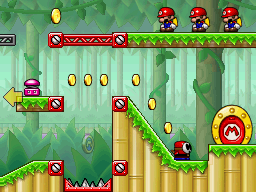 The Mini Marios begin on a platform over to the top right, with the exit door at the bottom right. In order to reach it, the Mini Marios must use the Warp Pipe and High Springs on the other side of the level to turn around and slide down the slope, defeating the sentry Shy Guy and allowing easy access to the door. The M-Token is located on the bottom center, atop a Red Girder area over a Spike Trap on the lower level. To collect it, a Mini Mario must simply drop down the Red Girder platforms to the lowest platform. The Mini Mario Card is located at the top left, to the left of the Warp Pipe entrance. The Mini Marios must simply enter the Warp Pipe from below and have a Red Girder bridge drawn to the collectible.